Safety is the number one priority for the U.S. Department of Transportation (USDOT) and it's the agency's policy to provide safe and effective pedestrian accommodation wherever possible. The Federal Highway Administration (FHWA) encourages the use of specific proven pedestrian safety countermeasures that can help achieve local, State and National safety goals. One of those countermeasures is the inclusion of raised medians. 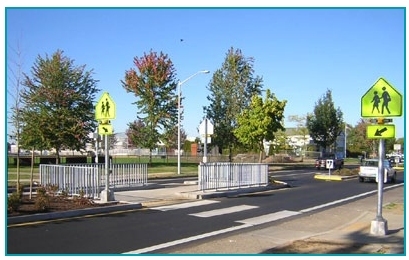 FHWA's Safety Office has promoted the evidence-based safety benefits of raised medians (or refuge areas). This flyer highlights three agencies that have implemented policies and plans that promote the inclusion of raised medians: the New York State Department of Transportation (NYSDOT), the Oregon Department of Transportation (ODOT), and the Florida Department of Transportation (FDOT). A median is the area between opposing lanes of traffic – a median can either be open (pavement markings only) or they can be channelized (raised medians or islands) to separate various road users. A pedestrian refuge island is located in or near a pedestrian crossing to aid and protect pedestrians crossing a roadway. 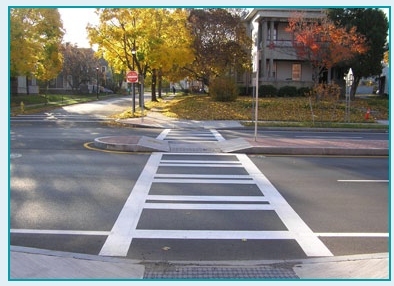 On wide streets, a median refuge can provide a safe location for those who begin crossing too late or are only capable of walking exceptionally slow...Pedestrian refuge islands or medians can also be used at intersections or midblock locations with shorter crossing distances, where a need has been recognized. These [raised medians] benefit pedestrians on two-way, multilane streets: it takes much longer to cross four lanes of traffic than two. Where raised medians are used for access management, they should be constructed so they provide a pedestrian refuge. Where it is not possible to provide a continuous raised median, island refuges can be created between intersections and other accesses. The implementation of these policies has encountered some resistance for reasons ranging from budget concerns to maintenance in the field. Each state has addressed these concerns in order to facilitate the inclusion of medians in roadway projects. In Florida, as the policy was being created, there was concern that projects already in the pipeline would be impacted. The decision was made to implement the policy on future projects, not projects already in design. In New York, concern over properly maintaining the roadways in winter with the newly installed medians was raised. The DOT addressed the concern by training and educating the snow plow drivers to ensure they felt confident in their ability to adapt to the new roadway design. 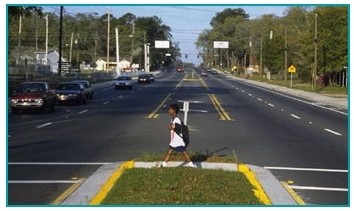 7 G. Long, G. Cheng-Tin, and B. Morrison, Safety Impacts of Selected Median and Access Design Features (Gainesville, FL: University of Florida, 1993). 11 U.S. Department of Transportation, Federal Highway Administration, Desktop Reference for Crash Reduction Factors, FHWA-SA-07-015 (Washington, DC, September 2007). 14 King, M. "Pedestrian Safety through a Raised Median and Redesigned Intersections," (paper presented at the TRB 2003 Annual Meeting held in Washington, DC, 2004).